In honour of my sister’s Columbus Day visit, I decided to make a full-size version of the Bakewell tartlets. This time, instead of a marzipan topping, I used a powdered-sugar based glaze. The recipe was basically a modification of the recipe for the tartlets. 1. To make the shortcrust, sift the flour into a bowl. Using a pastry cutter, cut the butter and shortening into the flour until it forms coarse crumbs. Pour the ice water over the mixture, tablespoon by tablespoon, until it begins to come together. Shape into a disk and refrigerate for at least 30 mins. 2. Preheat the oven to 350o. Remove the dough from the refrigerator and roll out to 1/8″ thick. Line a greased 10″ tart pan with the dough round. 3. Prick the bottom of the shell all over with a fork (to prevent puffing), place in freezer for 5 mins, then prebake for 8 minutes. Remove from the oven and let cool to room temperature. 4. Meanwhile, make the filling. Beat the butter with the sugar until creamy, then add the eggs and almond extract. In a separate bowl, whisk the flour together with the baking soda and ground almonds. Beat this into the butter mixture until fluffy. 5. 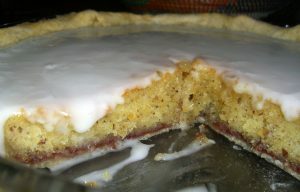 Spread a thin layer of raspberry jam in the bottom of the shell, then spoon the filling mixture on top. Bake for 20 to 25 minutes, until the top is are lightly browned. Remove from the oven and let cool completely on a wire rack. 6. Finally, make the glaze. In a large bowl, mix together the powdered sugar with some water. Continue to add water until the glaze is thick but pourable. Pour over the top of the cooled tart and smooth with an offset spatula.